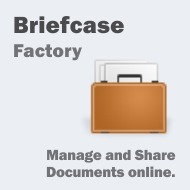 Briefcase Factory Demo - the well known File and Document Sharing Component for Joomla. Briefcase Factory is the only Joomla equivalent for Yahoo's Briefcase - A well known approach to document and file sharing. There is the possibility to use categories and a folder structure (virtual folder - the files are stored differently in the hosting) - this way users can keep their files organized and share specific folders to users or groups of their choice. The user interface is intuitive, AJAX driven, therefore page reloads are minimized to improve productivity. You can ADD more than one file at a time; number can be set in admin backend. The uploaded Files can be SHARED with one/more users, one/more groups, all users, or with the public (registered and unregistered users). To test the frontend functionalities use any of the users on the Quick login buttons. Share files, test downloads, upload files if needed. If you uploaded some files in the wrong folder you can always MOVE them as you please. Files can be assigned to several Categories (configurable in the admin backend) and the category can also be changed after the upload. Create Folders where you like, even folder in folder. Files Shared for Me by other users are accessible under a separate area and there is also a separate area for Public Shared Files, where any visitor can view or download files. Logged on as administrator you can access ALL the Files uploaded by all users on your system in the administrative backend. You can search after certain terms or filter one particular user. Any file can be deleted, renamed or you can change it's Category.